Eight-year-olds from a city school go beyond their age to understand and portray themes of bigotry, loss of morals, violence and distrust. CHENNAI: The lights dimmed out. A gentle melody played in the background as little Swarnalatha made her way to the centre of the stage, introducing the skit, The Day God Left Earth, which her classmates from Chennai Public School, Saidapet, had prepared for the audience at Alliance Française. Then, a young girl in white and an orange beanie took her place, awestruck by everything she saw. She was truth. Satya was followed by a young man in a saffron kurta, with a rosary hanging on his neck and a little peacock feather on his turban — god. What ensued was a simple yet enlightening conversation on why god wouldn’t want to stay in this world. 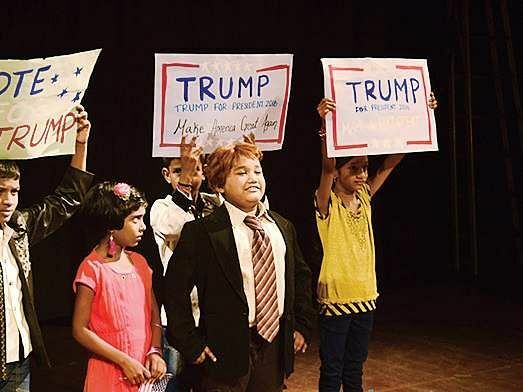 Bigotry, loss of morals, violence and distrust all made their way to the stage, with these eight-year-olds going beyond their age to understand and portray the themes. 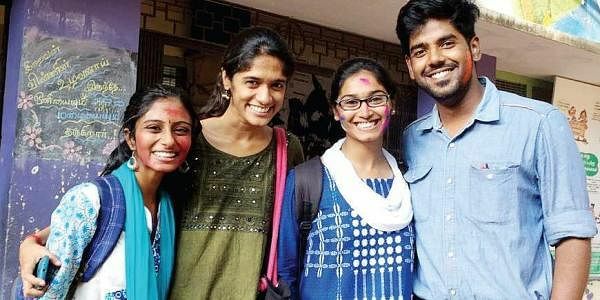 Standing along the sidelines was their proud Teach for India (TFI) tutor, Goutham Kumar. “For us, learning is not just about a blackboard and a book. My two-year stint with these children is coming to an end and the team has so many plans to give them the right kind of exposure. This performance for Crea Shakti was one of them,” says the 24-year-old TFI fellow. Practising for over five days, the 15-minute social satire saw the character of truth showing everything that’s wrong with the world to god — from local issues to Trump’s election, much to his disdain, ultimately forcing him to give up on humanity and leave. “God is one character we throw around to our own advantage. ‘Kadavul irukaru’ for everything. This is exactly why we chose to adapt that concept here — to show how god himself doesn’t warrant half the things that happen around us today,” adds the engineering graduate. Hemanth, her classmate and the boy who made people fall in love with him as Trump, insists that god exists everywhere and he himself has spoken to him. “God told me that I will be successful and that I should take care of everyone,” he quips innocently. Karthik, the boy who played the almighty, seems to be a little scared of divinity. “At temples, I have seen god enter my mom and uncle. I try not to look at them then. It is terrifying. What do you ask god then?” he says sheepishly. Razia, the kid who essayed the role of Satya, the truth, however slams the concept. “Everyone says they see god but in reality, nobody does. Everyone just remembers god when they are in trouble and forgets him when good things happen,” she avers. Many children hail from homes that are wrecked with dowry harassment, domestic violence, alcoholism, molestation and substance abuse, so much so that it has become commonplace for most. “Most of these kids are underprivileged and know what they are speaking about on stage; that’s what drives home the message,” Goutham says. He and his team have, over its two-year stint made an effort to expose them to diverse environments, from restaurant kitchens to book reading. “These are bright kids and we want them to realise what they are capable of.” Goutham is optimistic about the kids’ future. “They are all willing to learn and eager to be better than the day before. A happy child performs well and it shows,” he points out. Touting North Madras and Saidapet as the most worrying centres for TFI fellows, he adds that there is still much to do to get them ready for mainstream. With a first live performance ticked off their bucket list, these children have many more avenues to explore. “The idea was to get people to come and see just how capable these kids are. We need appreciation, not sympathy,” he smiles. And we agree!